My book How to Think Like a Mathematician is available and currently selling well - it is regularly in Amazon's chart for the 20 best-selling mathematics books. It is being adopted by prestigious universities in the UK and abroad. You can buy it at Amazon.co.uk, Amazon.com (in dollars), Blackwells online, from the publishers Cambridge University Press, and from almost any online bookshop. These links will take you to the paperback version. A hardback version is available. Sadly, all books have typos and errors which are missed before publication. If you find any errors, then please let me know and I can add the correction and your name to the list of corrections. I've started producing the solutions to the exercises. One or two of them will be fully worked solutions and some will be just hints. Writing the solutions will be a large task so I am doing it over time. If you have any particular chapters you want me to cover first, then please email me at the usual address! If you are a lecturer and want to distribute these chapters to your students (for free! ), then get in touch: k.houston(at)leeds.ac.uk. And if you want to buy the book in bulk for your students (it makes a nice intro week present for them and you get a discount), then get in touch with Corporate and Special Sales at Cambridge University Press. You can also see sample chapters at Amazon and at the publishers CUP, see the links above. Here is another demo video. 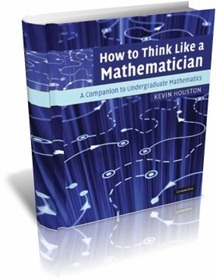 It has a connection to How to Think Like a Mathematician in the sense that the mathematics behind perfect shuffles is modular arithmetic which is covered in Chapter 29 of the book. Comments are of course welcome.